Learning to Fly Hang Gliders. Tow or Hill Training? If you intend to fly from hills then a hill training school will provide the most appropriate initial training, fully relevant from the start. If you live in a flat area and have a tow club nearby then it could be best to learn at a tow school. However most tow pilots will soon want to launch from hills. Initial hill training followed by a "conversion course" is the best option and still cheaper even if travel and B&B are included. The conventional way to learn aerotowing is to train and develop skills by hill flying. Once the hill pilot has the Pilot(Hill) rating (CP Hill + 25 hours) and is familiar with their glider they can take an aerotow conversion course with their local club for the Aerotow rating. This tried and trusted method has been successful for over 15 years of aerotowing hang gliders. 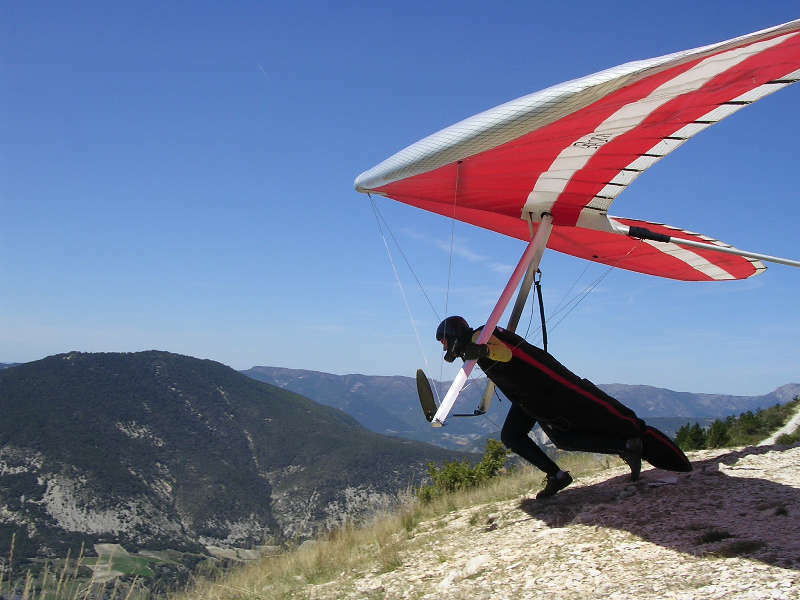 There are currently 8 hang glider aerotow clubs in the UK compared to nearly 50 hang gliding hill clubs. The range of micolights used by the UK aerotow clubs fly very fast. They are best suited to towing "sport" or "performance" class hang gliders. 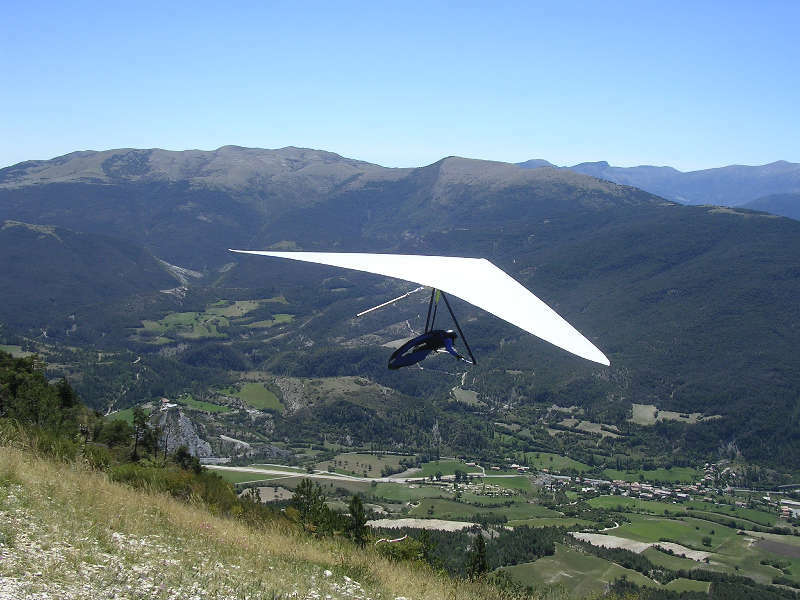 At South Downs Hang Gliding we offer a hill Conversion course run by professional instructors. With this endorsement you can fly at hundreds of hill sites around the UK. Learning to fly at a hang gliding hill school is cheaper, simpler and more appropriate if you want to fly from hills and mountains. At South Downs Hang Gliding the full course takes only 9 days, one day at a time when it suits your diary. Some people prefer to come for one day per week, others prefer a few days at a time. (To stay current, each day should not be more than one month apart). Each day you progress through the BHPA syllabus. We do not walk up hills carrying hang gliders! On the low training flights we use the breeze and wheels to let the glider blow itself uphill, very little effort, and within a few minutes, the glider is back ready for another flight. All higher flights are retrieved by vehicle. From the start the hill student learns how the air behaves near hills and develops the skills necessary to fly safely near the ground. After only 9 training days the student will have achieved more than 60 solo flights. That is 60+ launches and landings! All the time learning and experiencing the right weather for hill flying. Further airtime is completely free. The student pilot being able to make their first soaring flights at a hill club where they can fly for hours on the up-slope wind. The CP(Hill) rating is awarded after demonstrating three soaring flights of at least 10 minutes each. A winch or aerotow can be essential in flatlands and a real asset to a school where suitable training slopes are lacking. However, solely launching from a flat airfield and being pulled into the air, takes away a large part of learning the sport and will often lead to a poor launch technique and simplistic site assessment when transferring to hill flying. Tow students learn extra hazards such as line-breaks, lock-outs, weak-links, etc, that are only involved when relying on towing equipment. There is more to go wrong and is reliant on other people. If you want to fly hills then all this is unnecessary. Note that the CP (tow) only qualifies you to fly by tow launching, but not from the hills. Tow pilots can find it difficult to leave their "airpark" school and will continue to pay for all flights, having obtained what amounts to a "restricted" flying licence. Flightpark training, CP(tow), is an expensive way to learn to fly hang gliders. For similar money the average hill student can pay for all their training, buy a glider and have money left over towards a hang gliding holiday!